thanks to @Beatlebug i've joined the bowie club. One slight critique, though: do you think you could make it smaller and to the left a bit so it's more aligned with her face? I'll give it a go. I just put it through a website that stuck the lightning on the centre, but I think if I crop it cleverly it should align itself. Consider it a birthday present. 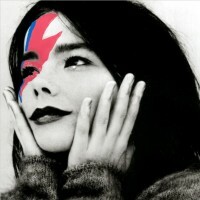 LOL I had no idea Bjork was Canadian! I haven't heard formal mention of this Bowie gang till now...sounds intriguing! and nice results from all, and much love to dear David...but I'm probably still gonna leave my apples stubbornly unadorned, for the time being. I do love fantasizing about the dressup-barbie style possibilities though! Add the "Man who sold the world" hairstyle, or apply the Hunky Dory gaze atop the apple, maybe? It certainly seems like that, yes. I wanted to change it to Lucy a week ago, but it took so long to find a picture that could actually be uploaded. your sig is also very gear. it describes me so well. Ah yes, I wanted to make a sig that everyone could relate to. That same logic applies to my avatar too. I think you're right in saying it has been particularly Bowie heavy around here lately, @vonbontee , with all the excitement from Fiddy getting into his music and everything. We've all caught the Bowie Bug. yes yes, this is all fiddy's fault. ...yes. Yes, exactly. Nothing to do with us at all, eh @TheWalrusWasBrian? Who even is David Bowie?? You're right, it's all my fault. No one had ever heard of David Bowie till I came along! And I would make a Bowietar, but Georgie's face is far too beautiful to cover up with a lightning bolt. Very lovely new avatar there, AILHY. I always appreciated that image, Lucy as a psychedelicized 1920s flapper. Striking colour palette too, all those tomato-reds. Hope you keep that as your avatar for...three weeks, at least!